I was never a huge fan of Ted Kennedy, even when he was useful in the classroom. When I teach about the U.S. Congress to my classes I often use Ted Kennedy’s book, My Senator And Me: A Dog’s Eye View Of Washington, D.C. It’s a children’s book about Teddy’s daily life as a U.S. Senator, narrated through the voice of his Portuguese Water Dog, Splash (Yes, conspiracy fans, that’s no joke.). The book offers a thorough yet kid-friendly look at the often tedious nature of lawmaking. Then I regale the students about a fateful night in Chappaquiddick. We know it too well—that infamous incident in 1969, the drowning of Mary Jo Kopechne in Teddy’s car, while the senator from Massachusetts saved himself and waited eight hours to file a police report. The kids love it, as most of us love when powerful people do bad things. However, his passing last night places me in a more forgiving mood—not too forgiving, but a little more conciliatory. Edward Moore “Ted” Kennedy leaves behind a complicated legacy, one of great highs and even more spectacular lows. His life and work prove to be a useful teaching tool for students. Kennedy’s personal failings, especially earlier in his career, can show students how even the greatest men are fallible—in Teddy’s case, stupendously so. Yet it can also show that even when dealt a crappy hand, we use what we are given to make a difference in our world. Kennedy’s career in the U.S. Senate is spectacular by any measure; even the most conservative Republican must concede this point. With 46 years under his belt, only Robert Byrd of West Virginia had more seniority in the chamber. He authored thousands of bills, guiding over 300 of them into law. His advocacy in civil rights, education, equal housing, and especially health care reform were unparalleled. Much of this success stemmed from how Kennedy dealt with events that would have destroyed other individuals. Two of his brothers were assassinated. He nearly died in a plane crash. He battled alcoholism and wild living. His family was the object of constant scrutiny. His own son, Patrick Kennedy, Congressman from Rhode Island, was just as wild as Dad. Because of these events—many of which were his own fault—Kennedy knew that his destiny was something different. Kennedy decided long ago that the way to make his mark was to essentially forget he was a Kennedy and become a great senator. Nobody could close a deal like Teddy; his colleagues on both sides of the aisle applauded his mastery of political dealing. Even with a steadfast liberal ethic, Kennedy understood that compromise gets things done in Washington. Yet Kennedy’s personal life cannot be ignored. Indeed, it has made him a figure of fun by liberals and conservatives. My personal favorite is comedy songwriter Bob Rivers’ “Teddy, the Red-Nosed Senator”, where Kennedy drives Santa’s sled and gets it wrapped around a maple tree. Only Teddy could manage a DWI with a team of reindeer. The Chappaquiddick incident, his alcoholic past, the scandalous behavior of himself and members of his family all hang like an albatross over the senator’s legacy. As an American worthy of study, teachers should not—indeed, must not—overlook Kennedy’s shortcomings. His mistakes alone warrant two days of lessons on “correct” behavior in the public and private arena. Should we hold public officials to the same standards of behavior as ourselves? Are celebrities, politicians and other public figures often “given a pass” for their misconduct? Can a community condone a severely flawed public servant, even when that servant does good things for the community? Yet Kennedy should not be seen simply as a drunken, lecherous buffoon. Even this exaggeration has fallen off the mark in recent years; his last marriage to Victoria Reggie was among the best 17 years of his life. Kennedy should be remembered as a complex character that rose above his failings to make an indelible mark on American politics. His senatorial career stands as one of the yardsticks by which all legislators should be measured. I was often at odds with Ted Kennedy. In fact, rare is the moment when I actually agreed with the senator on any position whatsoever. Yet I recognize a great lawmaker when I see one. 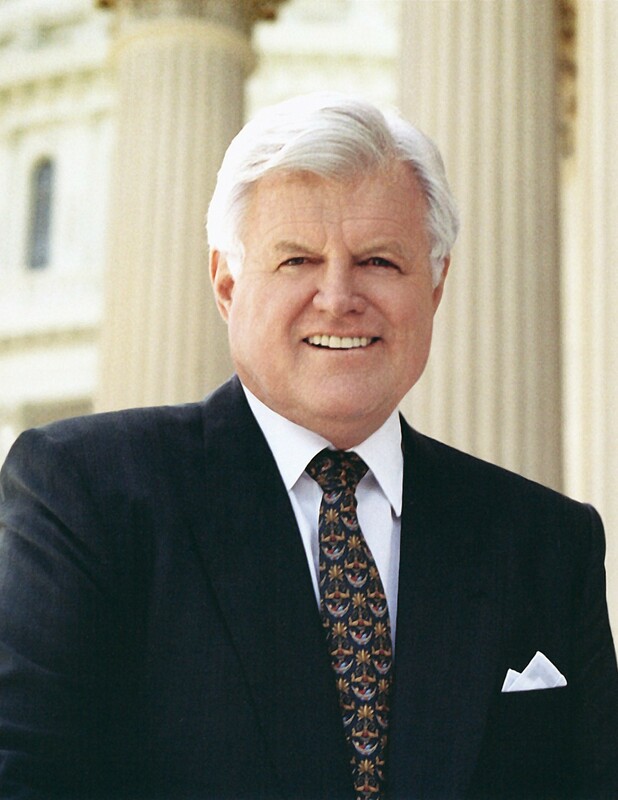 Ted Kennedy, I’ll miss kicking you around. But I’ll miss your command of the senate chamber even more. Tonight, I’m having a scotch in your honor. Cheers, old man.